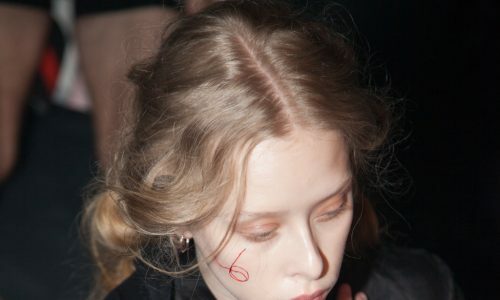 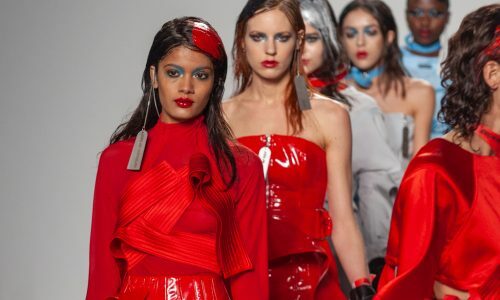 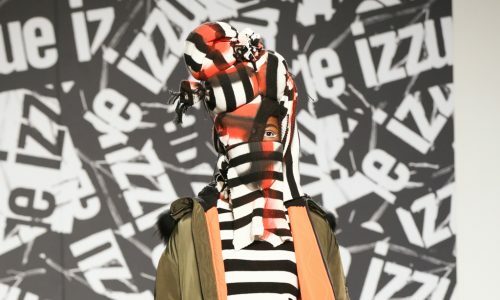 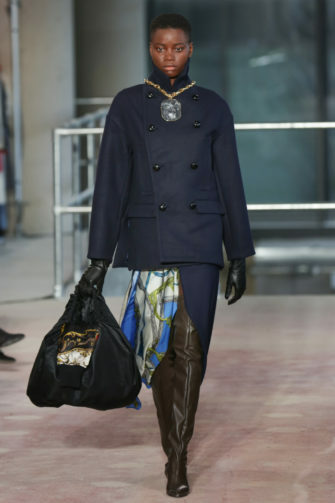 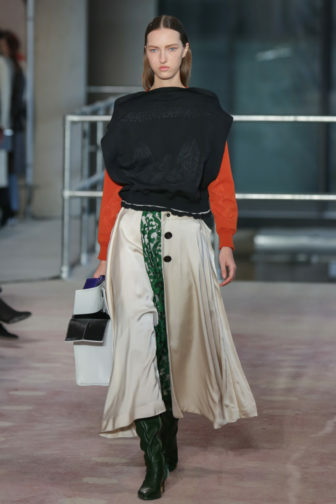 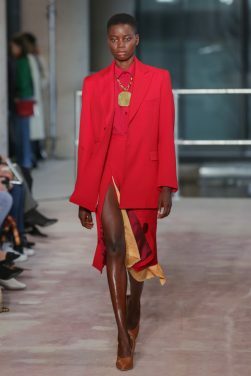 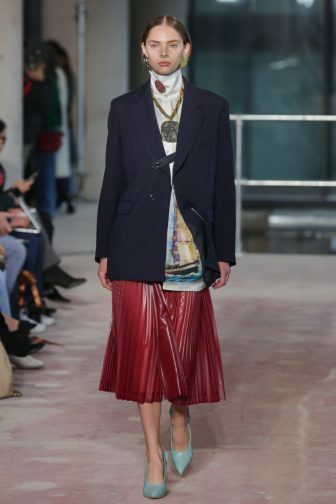 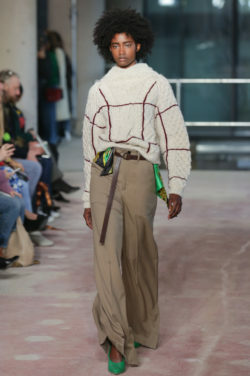 With a collection cryptically titled Unwrap, Typical, Release, Japanese label Toga’s autumn/winter 2018 show was a treasure chest of opulence nostalgic of the 80s, a visual delight that unravelled itself with grace and affluence. 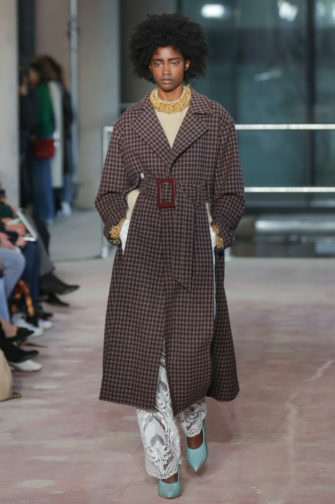 Although style sentiments were rather Dynasty-esque (absolutely a compliment, to clarify), they were cannily worked into contemporary pieces. 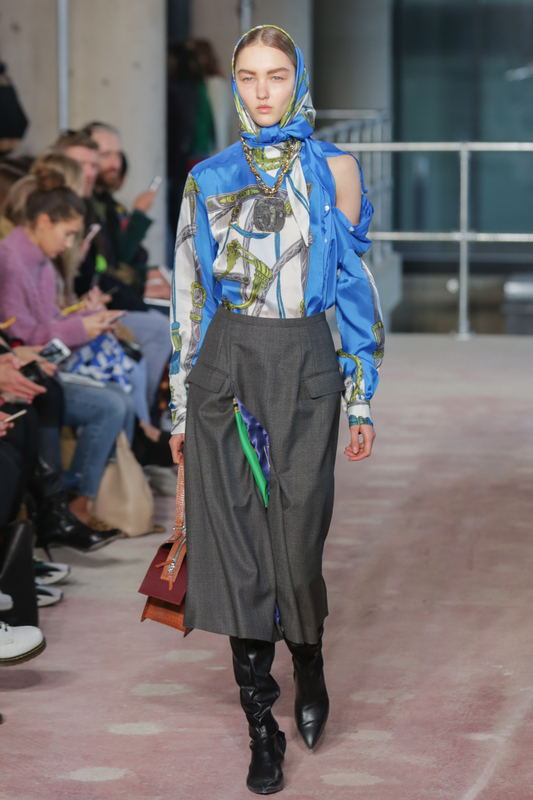 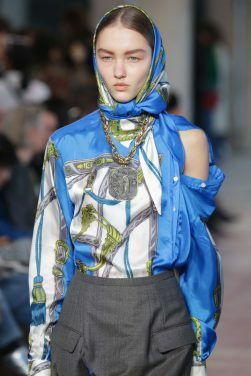 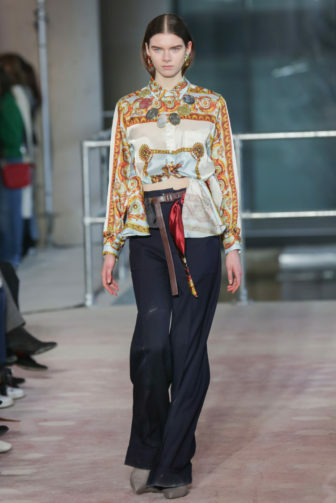 Intricately-printed silk scarves (think vintage Versace or Ralph Lauren) took form in blouses and sleeves, and trickled down the hems of outfits to create asymmetry. 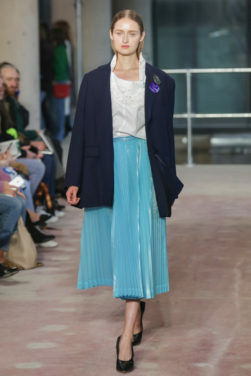 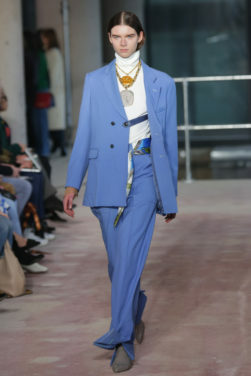 Meanwhile, double-breasted blazers were boxy but at the same time not too structured (some may call that a “boyfriend blazer”), and came in a spectrum of everything from periwinkle blue and crimson. 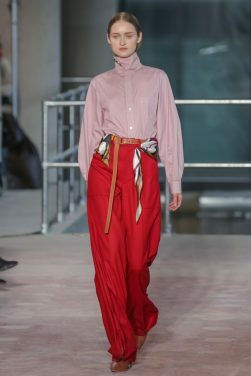 They were typically paired with flowing wide-leg trousers or asymmetric skirts that rippled effortlessly with every movement. 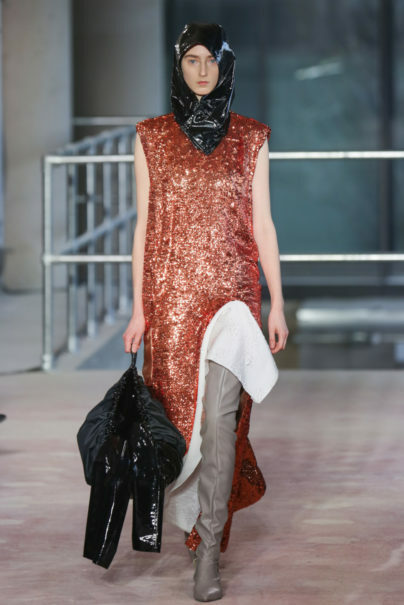 Textures were lightweight, but everything else was nothing short of decadent. 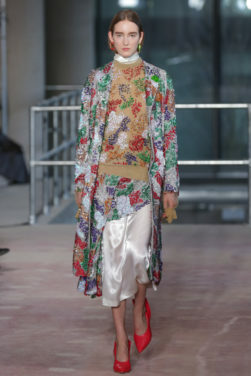 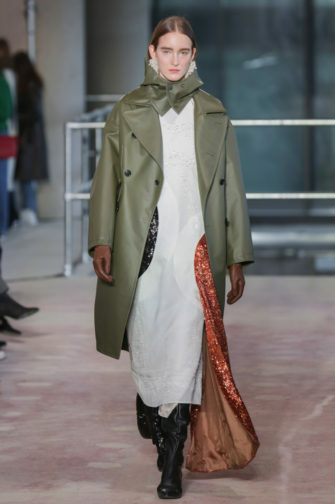 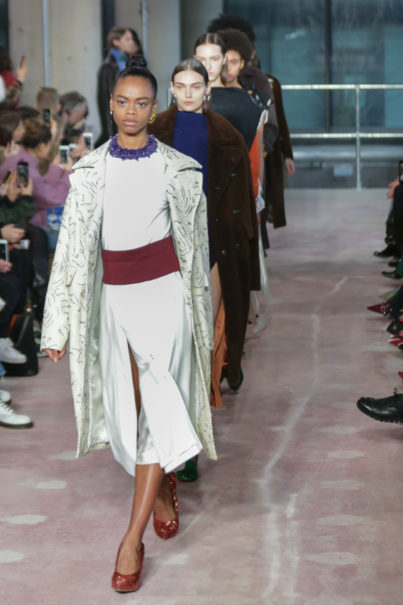 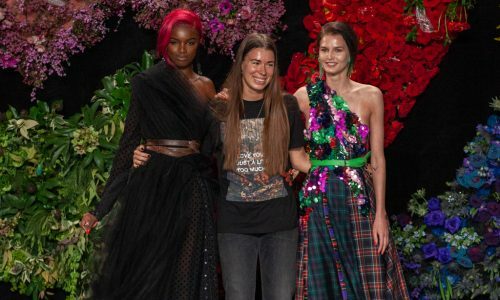 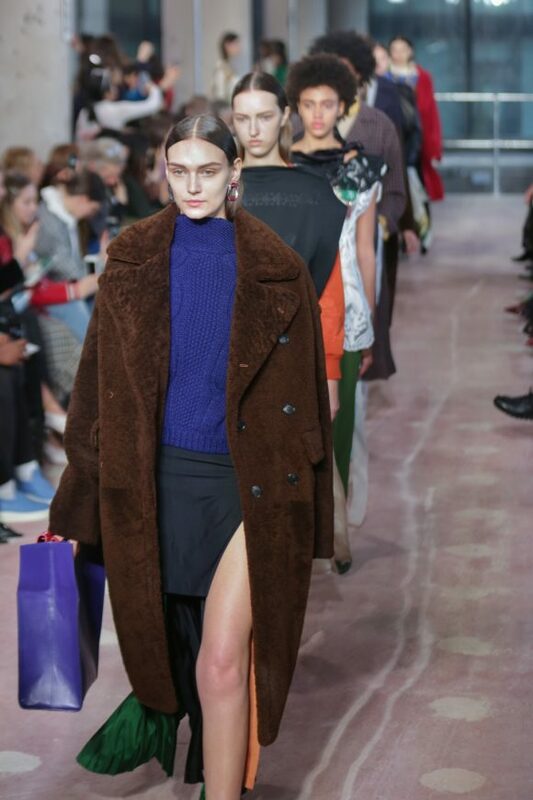 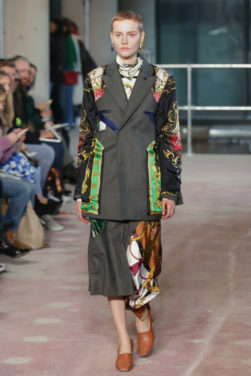 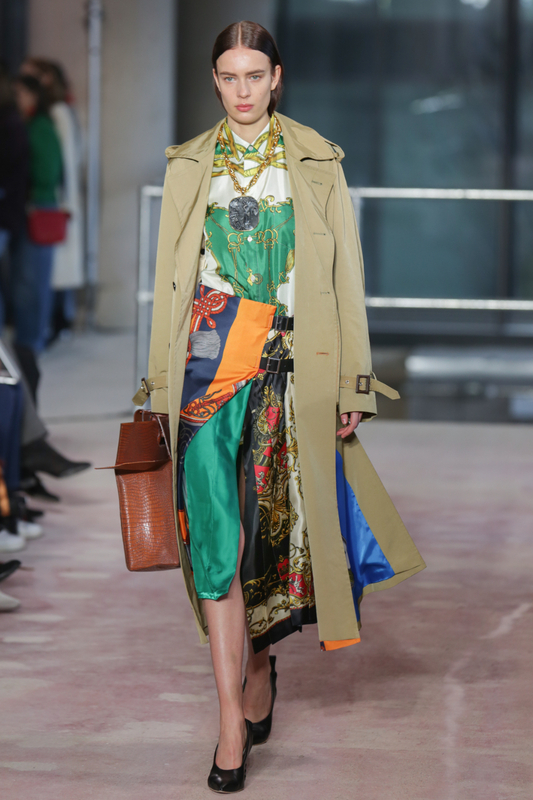 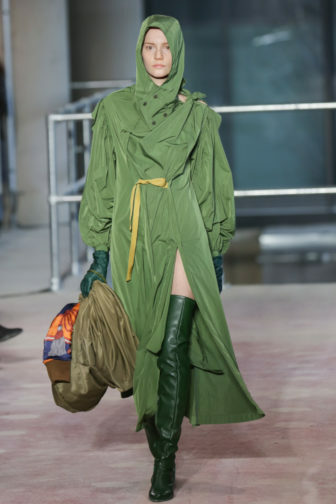 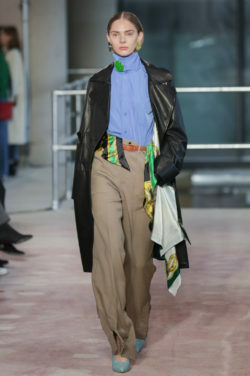 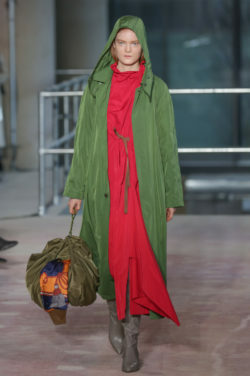 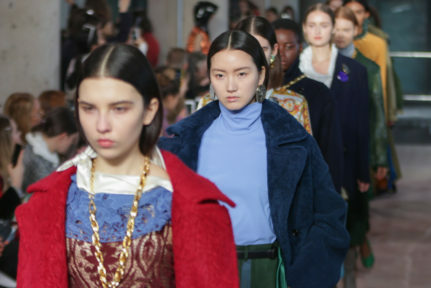 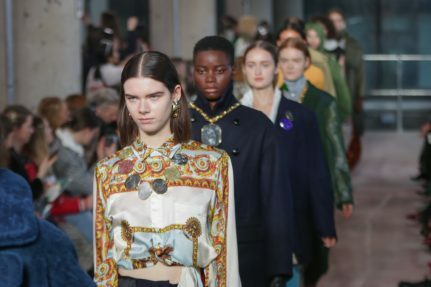 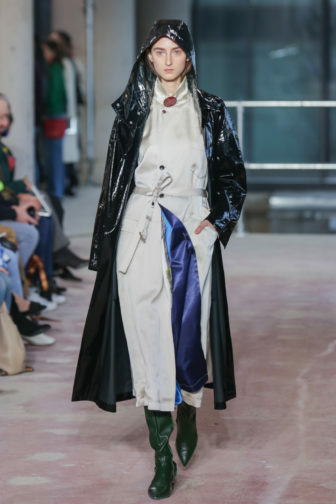 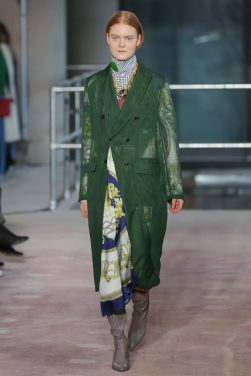 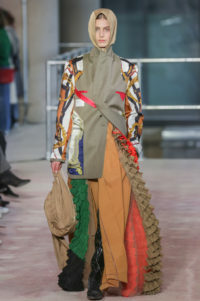 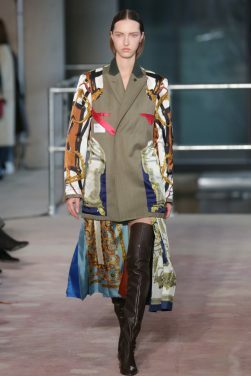 There was an abundance of overcoats in different finishes, from glossy black vinyl to cocoa-hued teddy to forest-Green leather, but one outstanding piece was a jewel-encrusted technicolor dreamcoat. 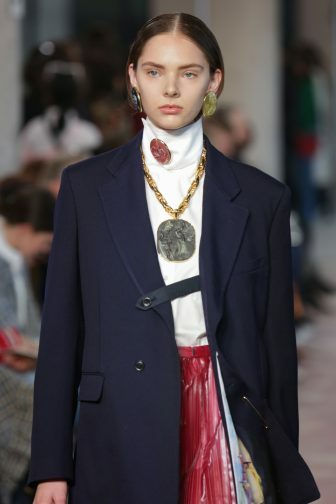 Square, oversized handbags, collars and ears were studded with enormous gemstones, whilst the ornaments also swung zealously from chunky gold chains. 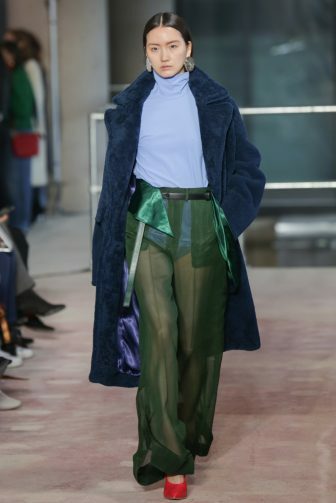 Mirroring the natural element of these minerals were some of the reoccurring hues in the collection. 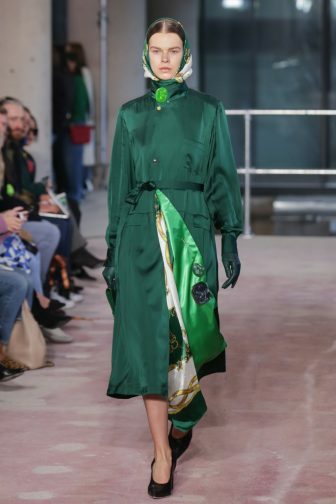 Shades of green included khaki, bottle green and vivid emerald; mink, navy and beige also complemented the richer saffron, turquoise and copper. 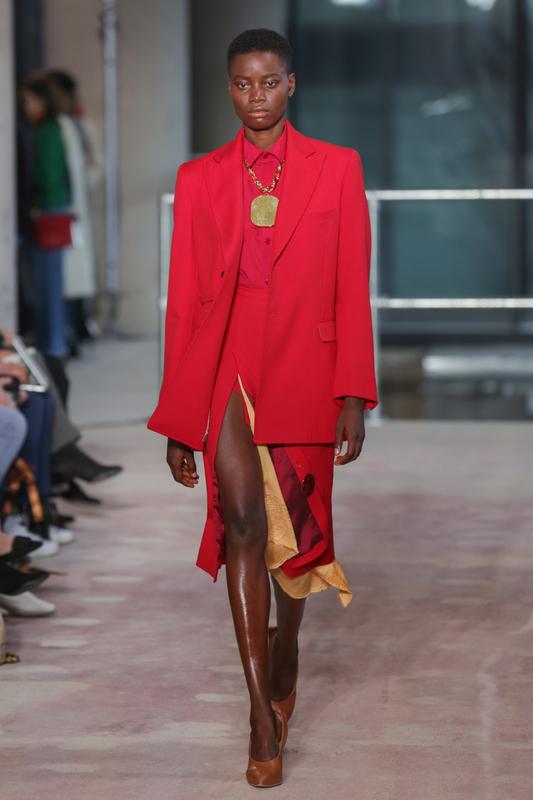 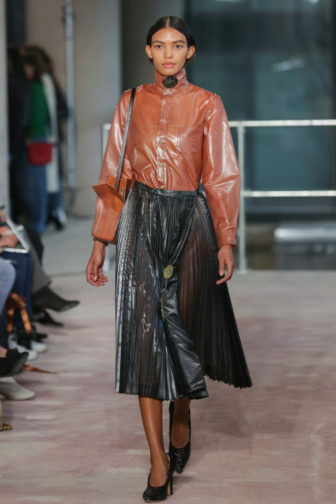 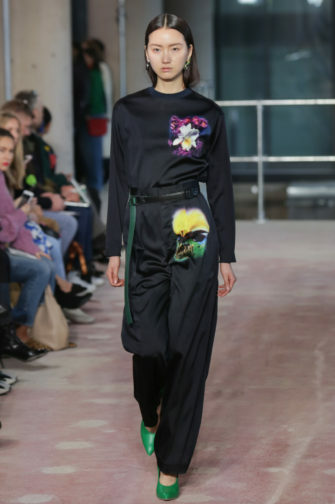 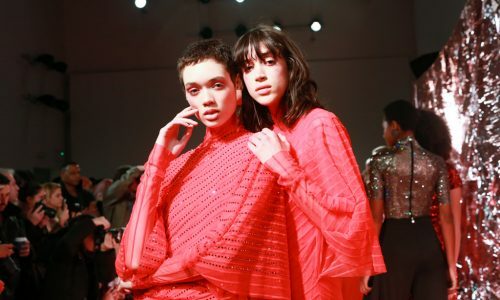 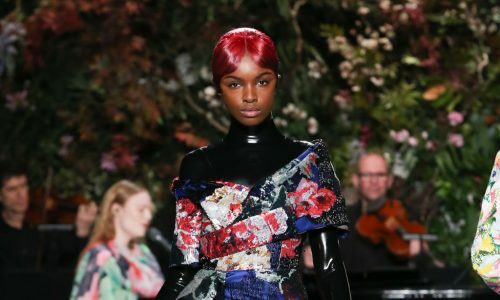 Every aspect of the collection was brilliantly grand and flashy, except for one thing; silhouettes were sleek and slinky, with every piece giving the wearer fluid movement. 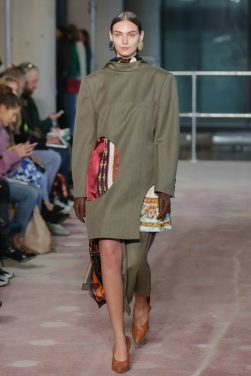 Even a heavily-sequinned copper maxi dress flounced off the model with ease, perhaps partly thanks to the thigh-high split. 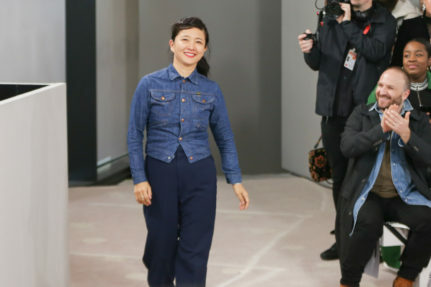 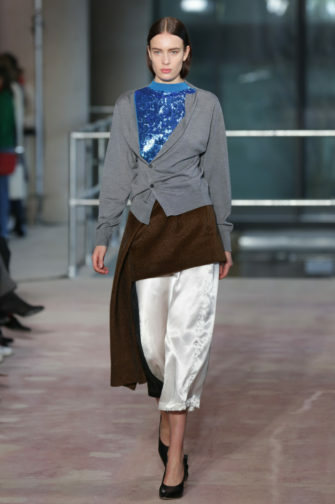 Unlike the collection’s title, there was nothing “typical” about Yasuko Furuta’s designs. 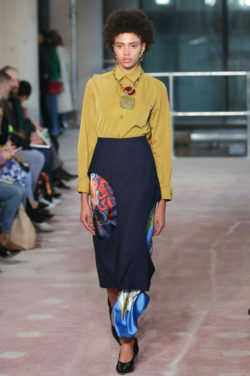 A marriage of both modernity and vintage splendour, Furuta demonstrated a skill of artfulness only a few have mastered.